Certain lichen species are especially sensitive to air pollution, while others are especially tolerant. For example, many species are sensitive to even moderate levels of SO2 pollution and rapidly disappear from polluted habitats. However, the "pollution lichen" Lecanora conizaeoides is very tolerant of SO2 and other pollutants, and readily invades habitats vacated by sensitive species. Especially sensitive or tolerant species are referred to as "indicator species" because their presence or absences can be a relatively accurate predictor of the air quality. Fumigation experiments with whole lichens and isolated symbionts have established sensitivities for many lichens to SO2, NOx, HF, ozone and metals. These studies have shown that even low concentrations of pollutants can be damaging to sensitive species. Lichen community composition can also indicate changes in air quality. In the United States, changes in lichen communities have been correlated with changes in air quality in southern California (Nash and Sigal 1998), Seattle (Johnson 1979), Indianapolis (McCune 1988), and the Ohio River Valley (Showman 1990, 1997). Air Quality and Lichens - A literature review emphasizing the Pacific Northwest, U.S.A.
Based on results of these studies, indices of lichen sensitivity have been developed to provide a measure of the air quality related values of information from lichen surverys. The most familiar published lichen sensitivity scales are those of Hawksworth and Rose (1970), de Wit (1976), Wirth (1991), and Insarova et al. (1992), all for European lichens. These scales are based on correlations between lichen distribution data and air quality monitoring data. In the Netherlands, where there is a country-wide, high-density air quality monitoring network, very accurate modeling of lichen responses to air quality has been done (van Dobben and ter Braak 1999). The US Forest Service National Lichens and Air Quality Database and Clearinghouse. Pacific Northwest Lichen Sensitivity Ratings by Species. Pollution-sensitive-- species that generally respond negatively to a wide range of pollutants. In the NCR study, these inlcude N-fixing cyanolichens (discussed below), Ramalina spp., Tuckermannopsis spp., and Usnea spp. Pollution-tolerant-- species that generally respond positively to a wide range of pollutants. In the NCR study areas, these include Physcia millegrana (one of the most pollution tolerant lichens in the U.S., McCune 2000), Candelaria concolor, Parmelia sulcata, and Punctelia rudecta. Nitrophiles-- these species thrive in nutrient-enriched areas receiving N inputs from fertilizer application in agricultural areas or N emissions from power plants, automobile exhaust or industry (van Herk 1999). Among the most common in the NCR are Candelaria concolor, Flavoparmelia caperata, Flavopunctelia flaventior, Parmelia sulcata, Phaeophyscia orbicularis, Physcia aipolia, Physcia millegrana, Punctelia rudecta and P. subrudecta. These are the most common lichens in the NCR plots, and can be found even in park units nearest the center of Washington, D.C. (NAMA, NACE). Acidophiles-- these species thrive on acidic substrates, some natural (such as Parmeliopsis spp. on conifer bark), others (such as Lecanora conizaeoides) affected by acid deposition (van Dijk 1988, van Herk 1990). Few of these lichens are found in the NCR, which appears to be affected most by eutrophication. Nitrogen-fixers-- these species contain cyanobacteria that fix atmospheric N. They are most commonly collected from shady, moss-covered rocks, soil and tree bases. Most are sensitive to all forms of pollution, especially SOx and NOx deposition, but also ozone. Herbarium records indicate that cyanolichens were common the Washington, D.C. area in the past. Some species (Coccocarpia palmicola, Collema furfuraceum, Leptogium cyanescens, Peltigera spp.) are still found occasionally in plots throughout the NCR study area, usually off-frame (below 0.5 m on trees or on soil). However, they are absent from park areas nearest the center of Washington, D.C. (NAMA, NACE). Lichen parasites-- Some fungi, known as lichenicolous fungi, are known to grow exclusively on lichens. These should be included in lichen surveys since they may respond positively or negatively to changes in atmospheric quality. 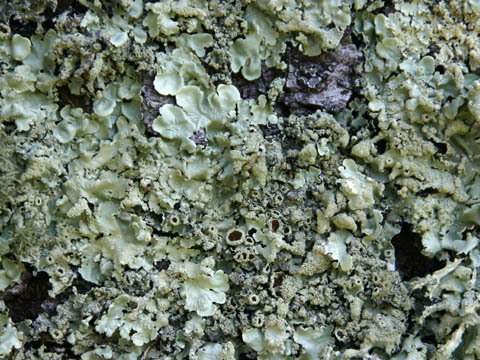 Lecanora conizaeoides, a pollution-tolerant acidophilous crustose lichen. Image © 2007 by Norbert Stapper from http://www.lichenology.info. 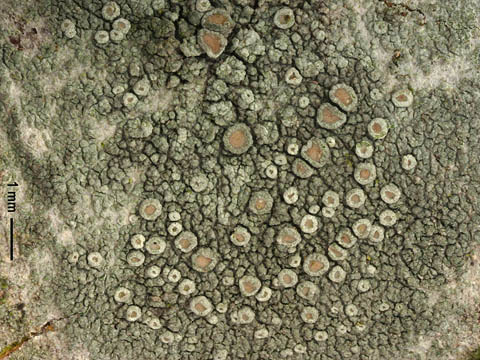 Flavoparmelia caperata, a nitrophilous foliose lichen used for elemental analysis. Image © 2006 by Paul Diederich from http://www.lichenology.info. 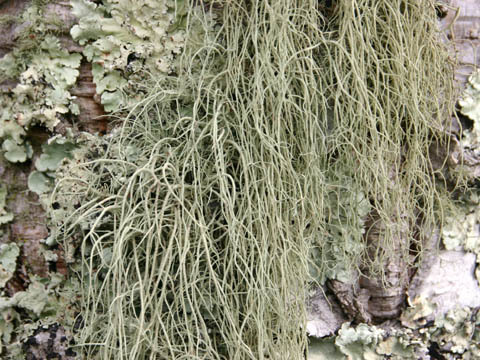 Usnea ceratina, an acidophilous, pollution-sensitive fruticose lichen. 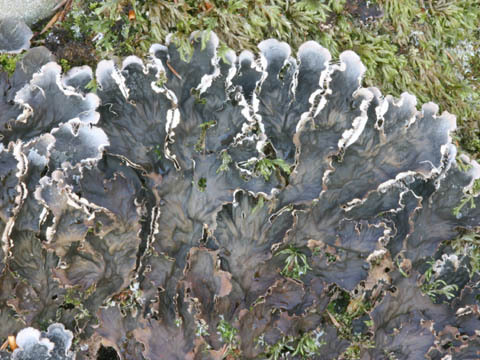 Peltigera praetextata, a pollution-sensitive cyanolichen. Image © 2004 by Paul Diederich from http://www.lichenology.info.